These spinach hotcakes are a perfect 'anytime-of-day' sort of meal. For non-vegetarians, they are really nice with smoked salmon on them and a herb salad. If you go with the salmon option, your probably don't need the cheese and nuts. For the hotcakes, wilt the spinach in a hot pan. Remove and squeeze all excess liquid. You should have about 65g. Roughly chop and allow to cool. Sift flour, baking powder, cumin, coriander and salt into bow, then add the whole egg, melted butter and milk. Whisk until smooth. Add spinach, chilli and spring onions. Gently stir through. Whisk the egg white until soft peaks form, then fold into the batter with a large metal spoon. For the greens, heat oil in a large pan over a low heat. Add leek and 1/2 tsp salt, then sweat for about 8 minutes. Add capsicum and cook for 2 minutes, then add greens with remaining salt. Increase heat and sauté for about 4 minutes until greens are starting to wilt. Remove from heat, add pepper, then stir through the dill, almonds and olives. Cover and keep warm. Heat a non-stick pan over medium heat, brush with remaining oil and melt a small amount of butter. Drop about 1/4 cup of batter to form round hot cakes with a diameter of about 10cm. Cook for 2-3 minutes until coloured underneath and bubbles form on top. Turn and cook for 1-2 minutes. Repeat with remaining batter. 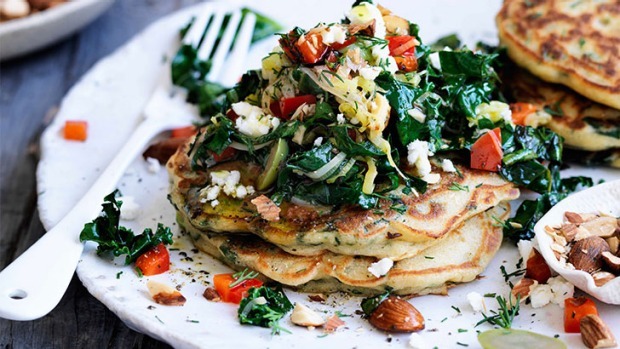 Serve hotcakes topped with greens, the crumbled feta and a wedge of lemon.